Voter suppression is rampant throughout the United States. It can manifest in many ways, including denial of a citizen's right to vote, as per the 15th Amendment, and/or any attempt to coerce or influence an individual to vote (or not vote) a certain way. Currently there is no way to track specific incidences of voter suppression by location or in real time, and many people are unsure of how to respond when they experience it first hand. In December 2016, I participated in a Debug Politics hackathon in San Francisco, where I designed a solution to address this crisis. My responsibilities for this project included researching the problem space, concept ideation, copywriting, fact-checking the laws with expert volunteers, designing user flows, and prototyping. What are Some Forms of Voter Suppression? So... How Might We Fight Voter Suppression? How Might We Raise Awareness? Voters text "Voteraid" to a number - this works regardless of whether they have a smart phone (Voteraid supports SMS). 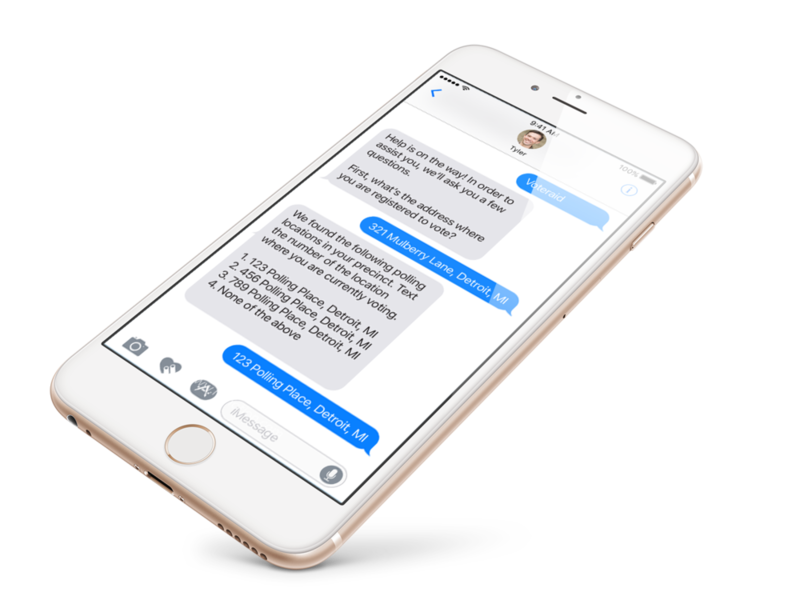 Voters can also access Voteraid via Facebook Messenger. 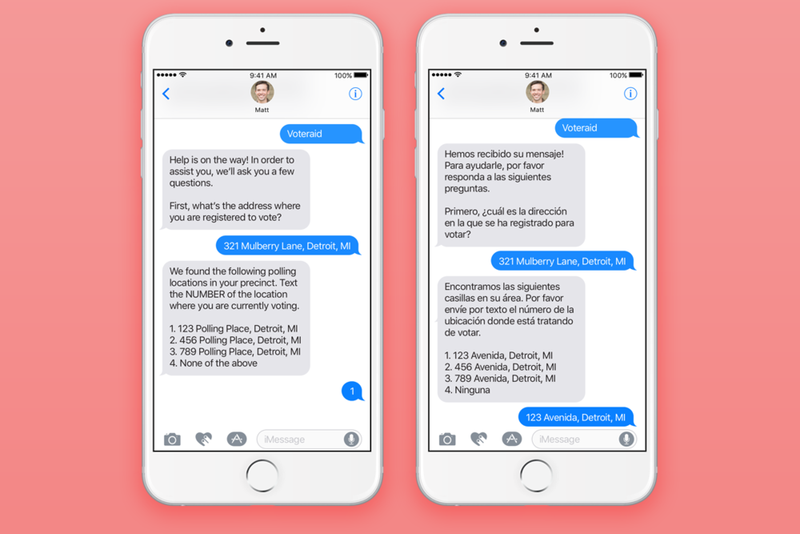 Voteraid uses location data and a database of state voting laws to generate automated responses that help voters understand their rights. Some issues may be too complex or sensitive to resolve via a chatbot. VoterAid refers voters to Responders when they need additional help. A "Responder" is a volunteer who helps users understand what's legal and what's not. They differ from Poll Watchers (also called Observers, Scrutineers, or Challengers, depending on state) in that they simply clarify voting laws to voters; they do not observe the voting process. 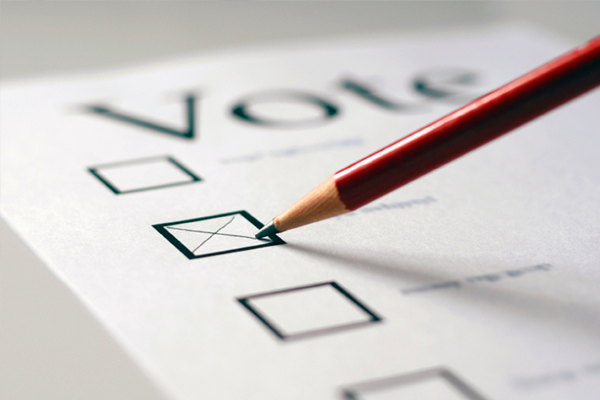 Poll Watchers can also clarify voting laws; however there are many restrictions in place regarding who is eligible to become a Poll Watcher, and how many are allowed per precinct (for example in Michigan, the number of Poll Watchers allowed per precinct is only 2). By recruiting "Responders" who are not bound by these restrictive laws, more people are able to provide immediate assistance to those who need it.